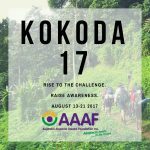 Kokoda17 is a once in a lifetime challenge for three intrepid adventurers whose lives have been touched by Alopecia Areata. Andy, Greg and Tracey will be tackling the Kokoda Track from the 13th to the 21st of August, 2017, in the aim to raise much needed funds and champion awareness of this condition. Help Andy, Greg and Tracey to meet their goals and change the lives of people living with this condition by rallying the support of your family and friends to help raise money for Australia Alopecia Areata Foundation Inc.